The moving Liquid Glitter Phone Case is designed for iPhone and Samsung Phones. It has real liquid glitter that moves. 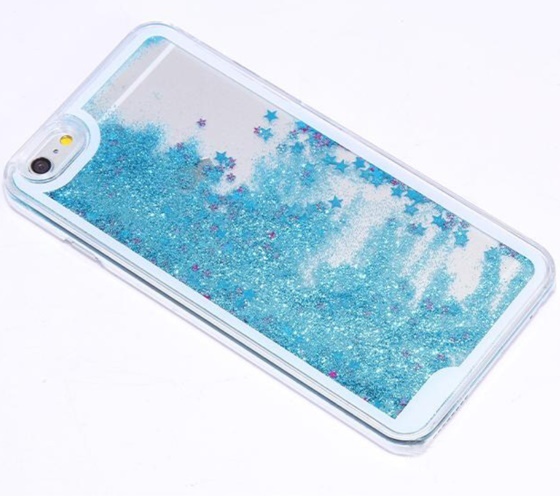 If you have heard of the Liquid Glitter iPhone Case with real moving liquid, I am sure you would like to see how it works. The moving liquid phone case comes in several colors and is made for iPhone 5/5s, 6 and 6 plus. The Samsung version is designed for Samsung S4, S5, S6, S6 Edge, Note 3 and Note 4. It is a hard case made from thick hard plastic that snaps on perfectly to your phone. It is not flimsy so it is probably a good choice for someone who does not change cases often. If you want a phone case that you can keep on for some time, this would be it. Keep in mind though, it does not cover the top or bottom bits of your iPhone. It covers the sides and back of your phone. Check out the video below. It shows two liquid iPhone cases in red and pink. It gives you an idea of how the liquid in the case moves around. It is a very cool case. After the video, there are some more notes I think you should know. As you can see the glitter is mixed with two different color stars. Some of the glitter move faster than the other adding to the experience. The Liquid Glitter iPhone Case is popular with teens but it is generally a fun case to have. To put on the Liquid Glitter iPhone Case, make sure your phone is free from dust. Slide the top right part on and snap the other three sides in place. If you would like to remove the Liquid Glitter iPhone Case, it may be difficult using just your hands. You should take an old card and carefully use to slip it off your phone. The Moving Liquid Glitter Case is available for iPhone and Samsung Phones. Do you like the Liquid Glitter iPhone Case? Share your views in the comment below.